Architects/Design+Build for Healthcare, Assisted Living, Apartments & Student Housing, RV Companies & Fabricators/Millwork Companies specify Maxstone products. 100% Acrylic Solid Surface sheets that compare favorably to Corian® & other major brands for commercial & residential projects. When the specification calls for acrylic solid surface sheets, MEGANITE® & ARRAY® are the best choices for quality, versatility, hygienic surfaces, conformance & price. RECYCLED MEGANITE® is SCScertified for potential LEED® points. Click for details. MEGANITE & ARRAY Solid Surfaces are certified by Greenguard and NSF, and they are perfect for all of these applications...and more. Click for ARRAY Showers Brochure. 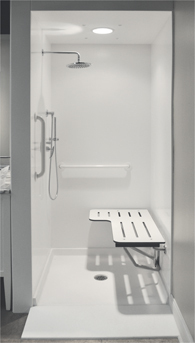 High quality, low cost solid surface ADA-compliant shower systems. The Maxstone warehouse is overstocked with many styles and colors of our popular products. These values on discontinued or limited quantity merchandise are too good to pass up! Call Kim or Phoebe at 877-778-1149 and find out what’s available and how much you can save. ganite compares favorably to Corian® 100% Acrylic solid surface.